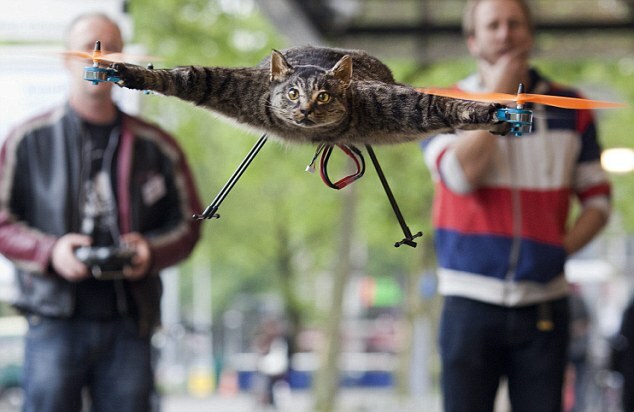 A Dutch artist turned his dead cat into a remote controlled helicopter. A Dutch artist Bart Jansen had a cat, Orville who was named after first aviator Orville Wright. Unfortunately Orville was run over by a car. After Orville’s death it was very difficult for Bart to part from his pet, like every animal lover or a pet owner. Right after mourning for some time, Bart thought of keeping his cat immortal. So to keep Orville’s remembrance for life he planned to turn his cat in to a helicopter. Dutch artist Bart first stuffed Orville in order to clean her dead body and then teamed up with the radio control helicopter flyer Arjen Beltman, to build a specially designed flying mechanism to attach to the cat. This half cat and half machine is a sheer masterpiece innovated by the team of artist Bart Jansen and Arjen Beltman. This ‘Orvillecopter’ is also displayed in a gallery during the famous Kunstrai art festival in Amsterdam. Where the audience can see Orvillecopter flying for themselves. According to Bart, by turning his cat in to flying machine he has paid tribute to his cat Orville. Bart and Arjen’s team is also planning to make this flying cat machine more powerful. On Orville’s birthday Bart is hoping to make Orville fly up high in the sky. The team is making mechanism for this Orvillecopter to fly with the birds. As Bart’s love for birds is also impeccable and wishes to make Orville a steady flight. This effort by Bart to keep his Cat immortal is unique and innovative in its own way. In coming years it would not be wrong saying that we can see this Orvillecopter flying high across the sky. Probably giving source of inspiration to every animal lover to make their pet immortal.